Spring is here and I have celebrated by getting my mitts on a Kaweco Classic Sport fountain pen. I have heard a great deal about Kaweco around the traps, they seem to have a fanatical following and I was keen to try one out. It was a very economical purchase, and for a light travel pen it is excellent. 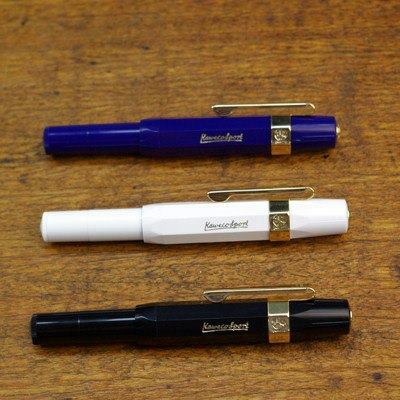 Smooth and good in the hand, and when the cap is on the pen is quite small, as shown above. I got my hands on a royal blue pen with gold trim, as shown at the top of the photo. I purchased the Kaweco from my favourite online shop Notemaker; I also stole the photo from their Facebook page, so thanks to the guys over there. On the weekend I am going to crack open a box of fine paper I purchased from Magnani Papers last year, I have kept it in store in the dark and have been holding off using it for no reason in particular. The whole process of getting the paper was enjoyable - it arrived in large book-sized sheets and I had a bookbinder in North Melbourne trim it down for me in his spare time for a shifty twenty dollar note passed under the table. The stock is at A4 now, and is ideal for fountain pen use, being a low bleed, high cotton content archival paper. I toyed with the idea of trimming it to Letter size, but the international standard seemed to get more out of each sheet. I will be interested to see how the Kaweco performs on good paper, I have only used it on standard bond stock to date. Perhaps Spring is a good time to write someone a letter, and send it old-school snail mail style. I have to send a parcel to a friend in Manila, so perhaps I can write her a letter - it is always better to receive a letter with a parcel, particularly when it is a gift. Sounds like a plan.